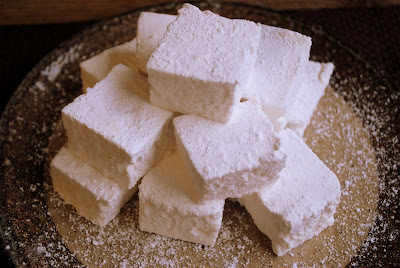 Before you say "oh geesh, I can buy them in a bag" let me say this: Homemade marshmallows are very easy to make! I kid you not. I am not a fan of the bagged marshmallows you buy at the mega marts. I will occasionally eat one that has been toasted (almost burnt) over the fire pit, but to eat one raw out of the bag - Blech! These marshmallows are a totally different animal. They do not compare one single iota to the air filled, flavorless, rubber specimens you buy at the store. These melt in your mouth and are fabulous in your hot chocolate. This recipe is from Ina Garten's Family Style cookbook. The last time I made these, I made the toasted coconut version. That was pre-blog time, so no pics, sorry. The toasted coconut ones are my favorite. I went with the plain version this time to satisfy the kiddos. Can you imagine trying to pick toasted coconut off marshmallows? They would try, trust me. You do need a candy thermometer for this recipe (you can get an inexpensive one at Walmart for under $5.00). A stand mixer is also a big help cause you do have to mix this for 15 minutes on high speed. Evan watched diligently until the thermometer reached 240. If you hate those bagged monstrosities, I urge you to make a batch of these. They just might be the best marshmallows you ever ate. Combine the gelatin and 1/2 cup of cold water in the bowl of an electric mixer fitted with the whisk attachment and allow it to sit while you make the syrup. Meanwhile, combine the sugar, corn syrup, salt and 1/2 cup water in a small saucepan and cook over medium heat until the sugar dissolves. Raise the heat to high and cook until the syrup reaches 240 degrees on a candy thermometer. Remove from the heat. (This took a good 5 - 7 mins for me). With the mixer on low speed, slowly pour the sugar syrup into the dissolved gelatin. 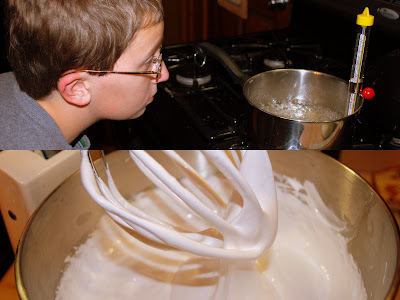 Put the mixer on high and whip until it is very thick, about 15 minutes. Add the vanilla and mix thoroughly. With a sieve, generously dust and 8x12 inch nonmetal baking dish with confectioners' sugar. I don't have a 8x12. I have plenty of 9x13 pans, so that's what I used. Pour the marshmallow mixture into the pan*, smooth the top (I used an offset spatula), and dust with more confectioners' sugar. Allow to stand uncovered overnight until it dries out. * Spray whatever utensils you are using with a bit of cooking spray. Makes it the mixture much easier to spread. Turn the marshmallows onto a board and cut them into squares**. Dust with more confectioners' sugar. 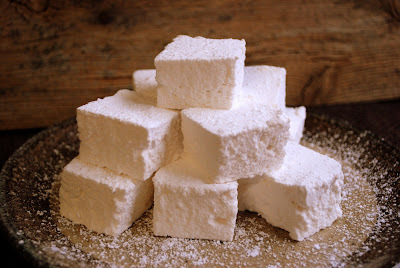 Pop into you mouth and thank yourself for going that extra mile and making homemade marshmallows that are a thousand times better then the ones in a bag! Yum! ** I had to make a note here. Ina, I love ya, but there was no way these babies were just fallin' out of the pan onto a board. They are sticky and gooey and it just wasn't happening. I took a long serrated knife, ran it under hot water and scored around the pan. Tried to flip it again...no go. I ended up cutting them in the pan with the hot knife. Worked out just fine. Just make sure you roll them around in more confectioners sugar to coat all the sides and stop them from sticking to each other. I have read other places to use a confectionary sugar and cornstarch mix to coat the pan and to first line it with aluminum foil and cooking spray to get those suckers out better. I think I might actually have to give these a try now!! Look super yummy! Oh, I can't wait to try these!! I have always looked on homemade marshmallows with envy. How exciting to see they are pretty easy! I have always wanted to try this but have wondered if they come out of the pan. What if you lined it with parchment? Homemade?? Wow, you make them look so easy Lisa! We're ashamed, we always buy them from the bag. These toasted coconut versions are just amazing. They're added on our list! LOL, I can see how frustrating it would be to pick off the toasted coconut one...by....one! Glad the kids have their own version. I might try a peppermint batch. Or, an hint of orange batch. I'm very excited to give these a try! Yours look wonderful! I've wanted to try making homemade marshmallows for years :)..Thank you for making it look simple and lovely. these look amazing...i'll definitely have to give them a try!!! thanks for sharing!! !